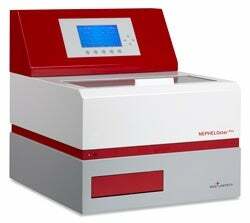 BMG LABTECH is proud to announce the newest addition to its family of microplate readers, the NEPHELOstar Plus. The NEPHELOstar Plus is the world’s only laser-based nephelometer that measures light-scattering in a microplate based environment. Light-scattering is an alternative to absorbance measurements and it is a technique that measures the turbidity or solubility of a sample in a solution. This nephelometric microplate reader offers the HTS or drug screening laboratory an easy-to-use, low cost and rapid method for checking the solubility of compounds. In addition, it offers microbiology laboratories a more precise method with a larger dynamic range to measure cellular growth. The NEPHELOstar Plus detects insoluble particles in liquid samples by measuring forward scattered light. The flexibility and performance of the NEPHELOstar Plus allows more applications to be adapted to light-scattering than ever before. These applications include: compound solubility screening, microbial cell growth kinetics, antibody-antigen interaction, immunoprecipitation and polymerization monitoring. The NEPHELOstar Plus can be up to thirty times more sensitive than traditional transmission readers that measure the absorbance via optical density. Options to adjust the intensity and beam diameter of the laser light allow for more precise measurements in colored or turbid solutions. In addition, the flexible beam diameter allows for measurements in 24, 48, 96 and 384-well microplate formats. These features, along with BMG LABTECH´s Digital Photon Integration (DPI) technology and a detection angle of 80°, ensure that the NEPHELOstar Plus nephelometer is approximately thirty times more sensitive than conventional transmission readers. Developed to meet high-throughput demands, this microplate-based nephelometer is faster than conventional solubility detection methods with the highest possible sensitivity and flexibility. Thus the NEPHELOstar Plus is an ideal solution for those looking for a compound solubility, microbial growth, or some other light-scattering measurement application. BMG LABTECH is a leading developer and global manufacturer of microplate reader instrumentation with a wide range of measurement methods. Microplate readers are used in the pharmaceutical and biotech industries, as well as in academic research establishments, for both basic research analysis and high throughput screening. BMG LABTECH focuses solely on microplate readers and offers the most diverse selection of optical detection systems in conjunction with integrated liquid handling equipment. BMG LABTECH, bringing the future of microplate reader technology to you today.